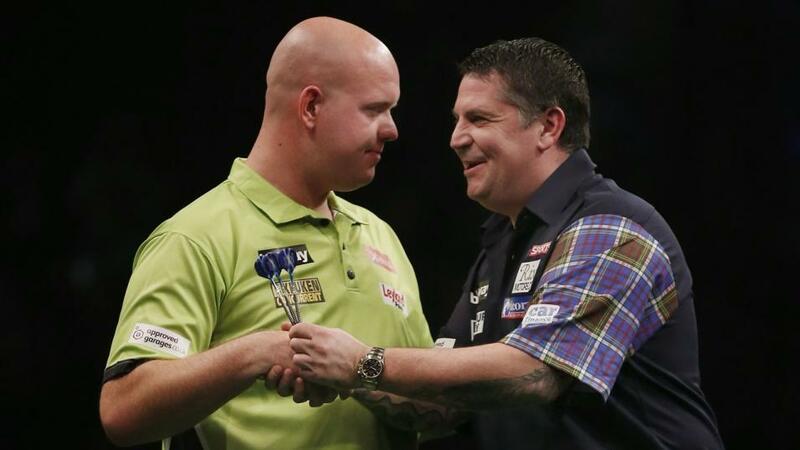 Both Michael Van Gerwen and Gary Anderson will feature in tonight's action. "In terms of averages for the tournament, he hasn't been below-par in the slightest as he boasts a 106.96 average in comparison to Clayton's 95.79. We all know that Van Gerwen's scoring power is unrivalled when he's on the very top of his game, and his first-nine dart average of 118.91 for the event definitely backs that up. " Gary Anderson has expressed in revent times his desire to win the Grand Slam of Darts, and it's been the one title that's escaped him the most, as the Scot has claimed the World Championship twice, the Premier League twice and the World Matchplay. And the former back-to-back World Champion will be looking to win the World title for a third time this December, but if he was to win the Grand Slam it would give him a huge boost heading into the event at Alexandra Palace. However, standing in Anderson's way is arguably the underdog of the event so far in Michael Unterbuchner. The 30-year old from Munich stunned Ian White in the group stages eliminating the Stoke ace from the event. He then went on to end James Wade's magnificent run of form, seeing off the Machine in an impressive 10-6 victory on Thursday evening. I think Unterbuchner will bring his A game this evening, but a Gary Anderson in full flow is very dangerous. There's a ten-point discrepancy in favour of the Flying Scotsman when it comes to tournament averages, he has an average of 100.38 compared to Unterbuchner's 90.46. My recommended bet for this one is Anderson -6.5 on the Alternative Handicap market. In every department, Anderson's game is far more superior to the German's, and I feel that the Scot will bring his A game and ease his way into the semi-finals. This match could be closer than first anticipated, many critics and pundits had wrote of Jonny Clayton's chances of event getting through group A as his form suggested that he wasn't playing his best game. But the Welshman couldn't have had a better start to his Grand Slam campaign. The Ferret topped the group with three wins from his three group matches with the highlight being of course that simply stunning 5-4 victory over Michael van Gerwen. Despite the format being so short, it really did bring the best out of both players. Van Gerwen was on the verge of breaking the average record, which of course he set himself. The Dutchman was averaging around 122 as he moved into a 4-2 lead, but with Clayton averaging around 115 himself, he wasn't going down without a fight. The Welsh survived several match darts as he reeled off the final three legs to edge the match. But as for tonight's encounter, Van Gerwen one really does love the long matchplay format, and I feel that in the early stages, it will be a closely contested affair, but MVG has the ability to reel off 11-13 dart legs on a consistent basis. In terms of averages for the tournament, he hasn't been below-par in the slightest as he boasts a 106.96 average in comparison to Clayton's 95.79. We all know that Van Gerwen's scoring power is unrivalled when he's on the very top of his game, and his first-nine dart average of 118.91 for the event definitely backs that up. My recommended bet for this one is Over +24.5 Total Legs as I feel that Clayton will stick with MVG, especially in the opening two sessions, but Van Gerwen will break away in the latter half of the match.